Worst earthquake has affected more than 3 lac people in Baluchistan on 25th September 2013. The 7.7-magnitude earthquake killed at least 328 people and wounded hundreds. Awaran was the most affected district where 90% of houses had destroyed. There were not enough medical emergency and surgical facilities in Awaran to deal with such situation. The DHQ Hospital Awaran had rudimentary services, and was not able to cope with the serious patients. 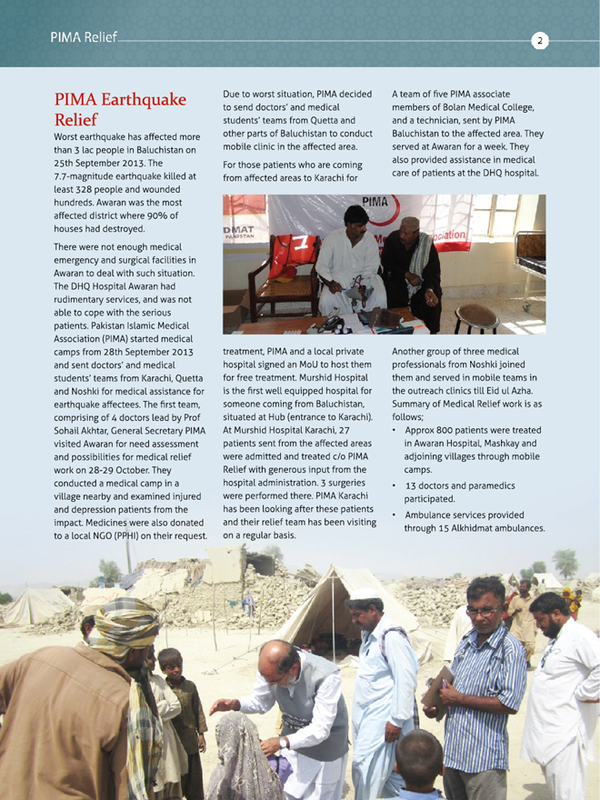 Pakistan Islamic Medical Association (PIMA) started medical camps from 28th September 2013 and sent doctors’ and medical students’ teams from Karachi, Quetta and Noshki for medical assistance for earthquake affectees. The first team, comprising of 4 doctors lead by Prof Sohail Akhtar, General Secretary PIMA visited Awaran for need assessment and possibilities for medical relief work on 28-29 October. They conducted a medical camp in a village nearby and examined injured and depression patients from the impact. Medicines were also donated to a local NGO (PPHI) on their request. Due to worst situation, PIMA decided to send doctors’ and medical students’ teams from Quetta and other parts of Baluchistan to conduct mobile clinic in the affected area. For those patients who are coming from affected areas to Karachi for treatment, PIMA and a local private hospital signed an MoU to host them for free treatment. Murshid Hospital is the first well equipped hospital for someone coming from Baluchistan, situated at Hub (entrance to Karachi). At Murshid Hospital Karachi, 27 patients sent from the affected areas were admitted and treated c/o PIMA Relief with generous input from the hospital administration. 3 surgeries were performed there. PIMA Karachi has been looking after these patients and their relief team has been visiting on a regular basis. A team of five PIMA associate members of Bolan Medical College, and a technician, sent by PIMA Baluchistan to the affected area. They served at Awaran for a week. They also provided assistance in medical care of patients at the DHQ hospital. Another group of three medical professionals from Noshki joined them and served in mobile teams in the outreach clinics till Eid ul Azha. Approx 800 patients were treated in Awaran Hospital, Mashkay and adjoining villages through mobile camps. 13 doctors and paramedics participated. Ambulance services provided through 15 Alkhidmat ambulances.